Here's what her allies are saying — and her foes' the most brutal zingers. 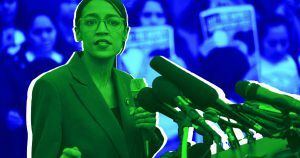 Yesterday, the left wing of the U.S. Democratic party unveiled the “Green New Deal,” a broad-spectrum plan to fight climate change that would radically reshape the future of energy policy and infrastructure in the United States. The plan — and its champion, the newly elected U.S. Representative from New York Alexandria Ocasio-Cortez — immediately drew strong reactions from across the political spectrum. Here’s our roundup of the burns, the boosts, and the friendly fire. • Obama administration Energy Secretary Ernest Moniz piled on. “I’m afraid I just cannot see how we could possibly go to zero carbon in a 10-year time frame,” he told NPR. • Others said the plan didn’t go far enough. “By failing to expressly call for an end of the fossil fuel era, the resolution misses an opportunity to define the scope of the challenge,” Friends of the Earth President Ericha Pica told Bloomberg.